This humpback whale necklace has been intricately carved with a unique Maori/Polynesian tribal style design.Whales are deeply revered in many Polynesian cultures like the Maori and an important part of their culture and tradition. This piece represents the sacred spirit of the Paikea (humpback whale), often symbolized in Maori culture as a guardian spirit. 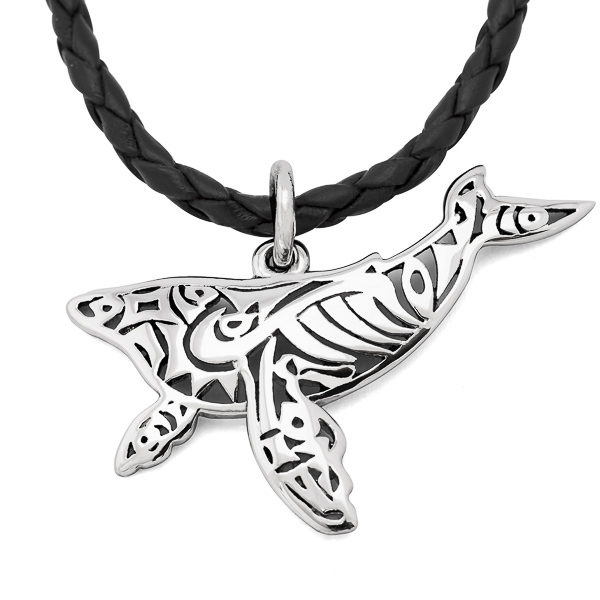 This whale pendant is a great unisex necklace, suitable for both men and women. Available in sterling silver or 9 carat yellow gold (white gold and other metals also available on request). Silver pendant comes on a plaited black leather necklace (42cm or 50cm) in our signature World Treasure gift pouch. Gold pendant comes with a complimentary gold coloured silk cord as well as a World Treasure gift box and bag. Free shipping worldwide on all orders.